"Taking home my baby bumblebee won't my mama be so proud of me..."
I must admit... I LOVE how this project turned out! I used the Oliver + S Nature Walk Pullover pattern in a size 2T. I wish I had made a 3T, but thankfully it fits him! Last night I was completely unsure if it would fit him and I really worked hard on it for Days 3 & 4 of the KCWC challenge. I know this project would have taken me a lot longer had I not had the KCWC fire under my bum! Fabrics: The black knit is from Cai's Pop's closet! Using this old shirt allowed me to keep the existing sleeves and just downsize them to fit Cai. The gray and white stripe is leftover from the Euro Sham I made for our bedroom and I had JUST ENOUGH to do this project. I wanted pops of color in this garment, so I used some teal cotton for the pocket lining and the hood lining. The bumblebee is made from some of the fabric that Ikea sent me to try out and review, which I will do next week! The black and white polka dot fabric is from Hobby Lobby, just a remnant I had lying around. His undershirt is from Target. I did not make that or the pants. We need to work on getting this boy some more summer shoes. Camo crocks didn't really make the cut for me, but his foot has grown so fast his others don't quite fit anymore! Skills Aquired: Whew! It was a LOT of work for a little hoodie. I mean, what child pattern should have over 16 pieces to cut out and sew together? I did add a little bit of extra work adding the lined hoodie, but when I tried putting both the stripe collar and just a plain teal color onto the shirt's neckline, I couldn't get over how it made it look like an 80's bowling shirt, so I had to go with a hoodie for a more modern look! Overall, I just gained some patience with this project, because it was so involved and when I woke up this morning, I realized I had sewn one sleeve on inside out and backwards....so maybe staying up to sew isn't quite as productive as one would hope! 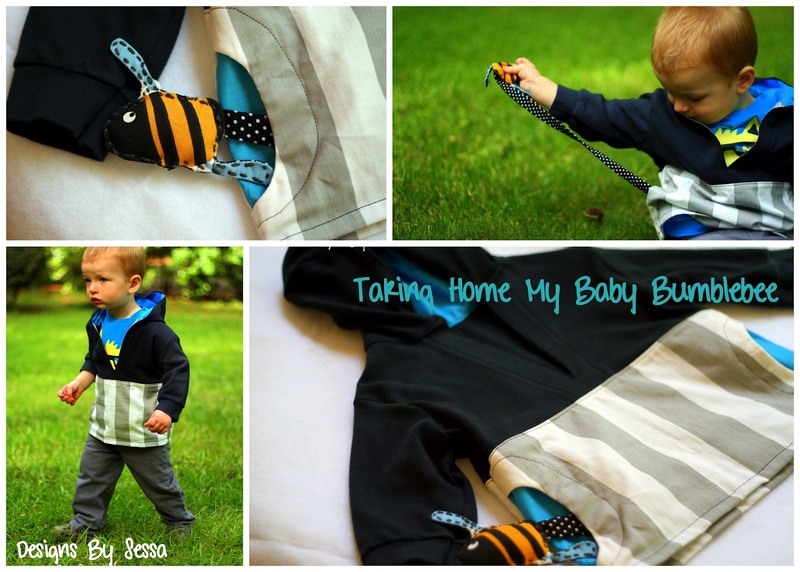 Making a pullover like this for a 19 month old, I kept thinking...but WHAT is he going to put in his pockets. I mean I doubt his hands will go in there... I have really been waiting for the right timing to sew with some of the items that Ikea sent me, so when looking over that fabric stash, it just hit me like bolt of lighting! How cute would it be to do a bumblebee?! I'll do a tutorial next week on how I made him, but I did pretty much handstitch him with some of my floss leftover from test embroidering Rachael's project. I know she will be proud! "Taking home my baby bumblebee, won't my mama be so proud of me!" How's your stamina going for KCWC? I'm getting a little burned out, but I still have a couple more things to get done!